Establishing blogger relations is an effective way to promote creative tourism and attract tourists to visit regions that lack the reputation of big destinations such New York, London, Barcelona, Madrid or Paris. Creative tourism is more than just spending time relaxing at the beach, or just sightseeing visiting museums, attractions and historical sites. UNESCO also defined the meaning of creative tourism in terms of organizing activities of learning from direct experiences such as participating in activities and interacting with local people. The goal is that tourists are not just passive visitors, but they become an active member of the community. Creative tourism is a new way to travel. This spring, the region of Mecklenburg (Northern Germany) has organized the project #balticdiscovery, which consists in a press trip of four days travelling around the beautiful German Baltic Coast (Wismar, Kühlungsborn, Büttelkow and Rostock). Journalist bloggers from Italy, Denmark, Austria, Spain and Germany were invited to learn about their creativity, culture, history, architecture, and culinary arts. #Balticdiscovery started with a journey to Wismar, a port city with one of the largest squares in Northern Germany and buildings protected by UNESCO. There, our group enjoyed dinner with Paetrick Schmidt, a local talented young artist who lives rather isolated in a studio on the last floor of the University building of Wismar. Schmidt went to study to Virginia with a scholarship in 2009. Some of his pieces have been displayed even in Japan. The atrocities of the Nazi violating human rights in concentrations camps are evident in some of his collage paintings. His studio is messy but at the same time his artworks are very clear-cut and most of the members of #balticdiscovery team are taken aback by his creations. An artist cannot stop thinking about his new creations and perhaps the visit of multicultural journalists from different countries inspired him with fresh innovative ideas for future masterpieces. Paetrick can stay for long hours working on one of his pieces because “once you are inspired you cannot stop since an artist can lose their focus and creativity”, he said. Admiring his paintings and collages, everyone can see his sarcastic, witty and smart humor reflected on the canvas. When #balticdiscovery asked him about the meanings of his work, he replies, “I am unable to describe my own work as it can be seen in many ways so I rather people to interpret my pieces themselves.”Paetrick gave to each member of #balticdiscovery one of his published books personalized with a dedicatory statement on the front page. This book might very well become a treasure in decades so it must be kept for future generations. #Balticdiscovery then continued its journey in Kühlungsborn, one of the top local destinations for German people who are attracted by the nature, green landscapes and a lovely beach. The journalist team went to a Museum Art Studio called AtelierhausRösler-Kröhnke, owned by Louise Rösler. She is the third generation artist in the family and keeps alive the creativity tradition. Louise explained that many of her relatives’ paintings were destroyed and burnt by the Nazi because their art did not follow the patrons imposed by the Nazi propaganda. In those times, Louise was denied to use certain art tools such as paint colors, crayons, and watercolors. She has created many of her collages from disposal materials like candy papers that American soldiers left during war times. Even old CDs, stamps, newspapers and empty markers were used by this wise lady to make beautiful collages canvas. Louise also uses old cloth to make new ones and in her house next to the museum, every room has a theme color that contrasts with the white walls. At her museum, we could also see a spectacular kinetic work collection. Büttelkow was the next stop for #balticdiscovery, and E-bikes were used to cover the 12km distance from Kühlungsborn. E-bikes are bicycles with an attached motor used to assist with pedaling. E-bikes have speed modes that allow you to specify how much extra power they provide.They are ideal to deal with steep hills, their electronic batteries give you a boost of 5 or 10km extra speed like F-1 Kers system. Herrenhaus Estate Büttelkow mansion is a guest house owned by Andreas Renner and his wife Antje. Renner has in his basement workshops where he creates amazing sculptures, paintings and artworks. Observing Renner´s work, you can notice that he has a gift for art in many ways because he is a master in many disciplines. 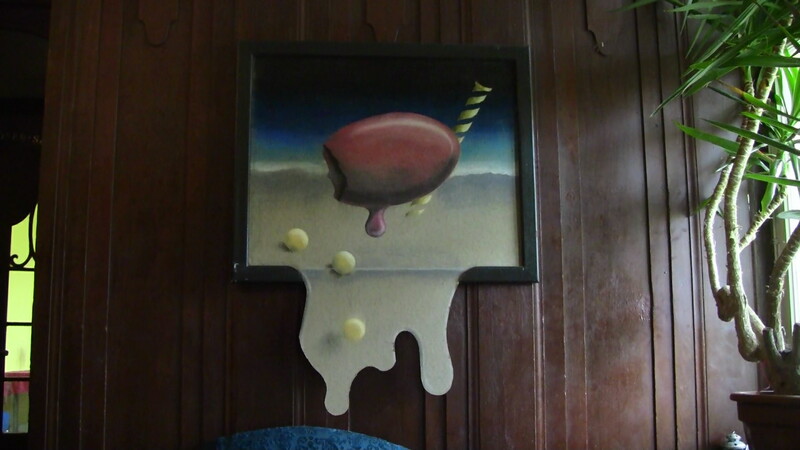 One of his surrealist paintings hanging at his hall entrance recalls Salvador Dalí style. 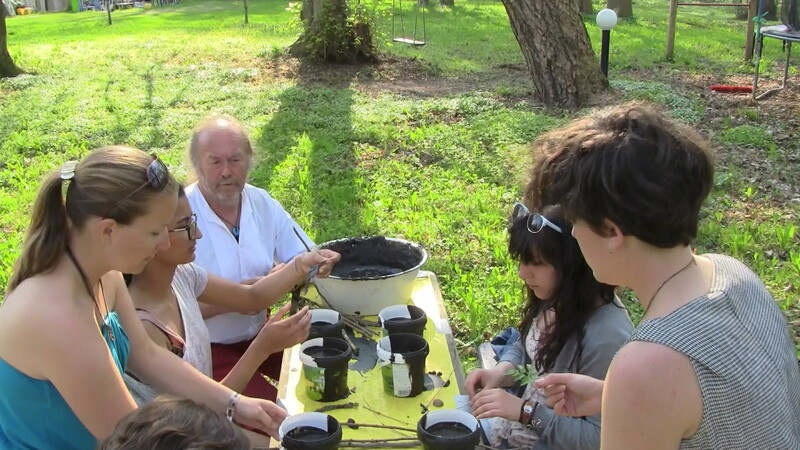 Renner offered #balticdiscovery two workshop sessions: the first one consisted in playing with hot wax to create objects using nature materials that were around in the garden such as branches and leaves from the trees, stones, and flowers. Hexagonal figures, masks, rings, or animals were made with this technique; at the second one Andreas gave to each member an A4 paper which included 6 frames. 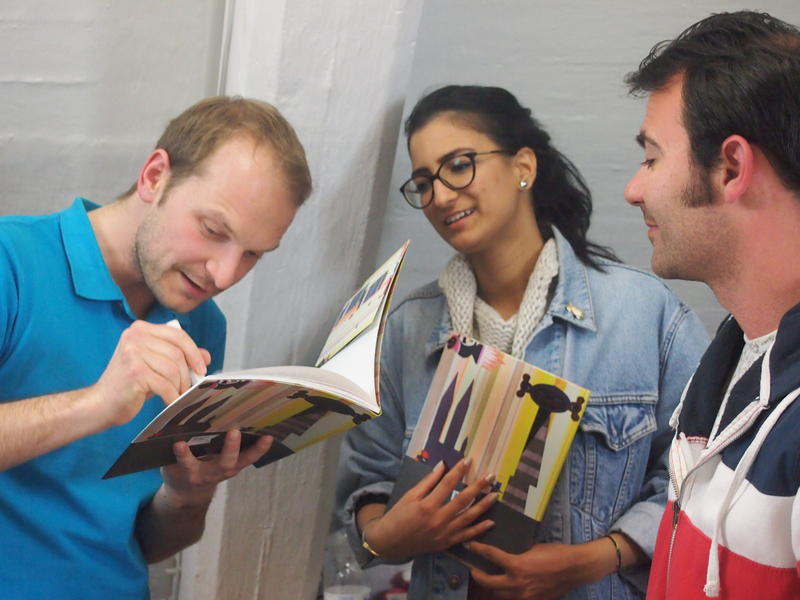 The idea of the activity was to draw the first thing that came to your mind and pass the paper to the next team member until all frames were completed. Colored pencils and marker pens were used for this seminar. The press trip finished at Rostock, the largest city of Mecklenburg and home to one of the oldest universities in the world, the University Of Rostock founded in 1419. #Balticdiscovery started its itinerary at ProduzentengalerieArtquarium, a creative space in the heart of Rostock that allows for a cross-breed of various forms of art such as photography, ceramic, graphic, porcelain, and jewelry. 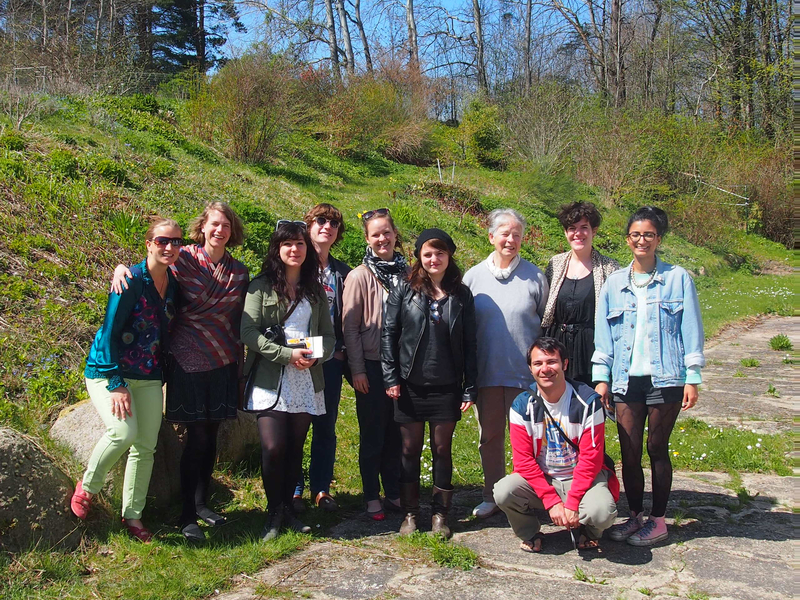 Anna Silberstein, a jewelry designer, showed us the Artquarium´s departments at the backyard. In her studio, she demonstrated how to make a ring from scratch step by step and explained all the tools involved in the process. #Balticdiscovery then popped in at nähmarie shop, owned by vintage designer entrepreneur Maria. She opened the small shop in June last year and since then her business has been growing very fast. Maria learnt sowing from her Greek grandfather and art crafting from her dad. She collaborates with important shops in Germany that ask her for specific clothing products. Her success lies in three key components: Handmade (DaWanda lovers will find unusual 60s and 70s items, clothes, bags and accessories), vintage (collectors of ancient treasures can find fashion, decorative items, accessories and more, all originals from 50s, 60s, 70s and 80s!) and material (lovers of creative and unusual vintage fabrics, trims or buttons would fall in love with her designs). The creative tour ended visiting a 21-year old clothing designer, Juliane Borths, who works and lives in her studio. Cold//byis the name of her brand and all her collection and clothing are made in the traditional way with a sewing machine. Borths sells her clothes on Internet and she also has some shops that buy her products. One of her pieces takes between 5 and 7 hours to make and she mixes old clothing with other raw material to make her clothing. This model of creative tourism is a way that is succeeding in many regions of the world choosing quality over mass tourism. The key is to identify what a region can offer that sets itself apart from others in order to create a specific quality niche.